Religions have used disability, like gender, to think with. After briefly essaying the ways religious systems think with and about corporeal anomaly, this chapter considers how the Christian West justified its “humane imperialism” by reading disability as degeneracy in need of medical remediation. Digging into the particulars of how disability became for Christianity the external boundary of what counts as human kin and kind, it considers two key historical epochs: (1) the early missional discernment of monstrosities at the ends of the earth which lent itself to the eschatological urgency of remediatory impulse (400–800 c.e. ); and (2) modern realism which developed a picture of Jesus-as-Healer simultaneous to the western colonial and scientific age of discovery (Kwok 1998). That epistemological rendering of Jesus authorized the transgress of boundaries in the name of healing. This exemplary history follows one particularly strong and residual valence of Christian missional colonialism towards the South, a valence heavily inflected with the deployment of the metaphor of disability as an affect-inflected, geopolitical map. Health may be a still under-analyzed vector of imperialism, one that has been easily cloaked by religious affect. Consequently, this chapter, reconsidering the metaphorical plethora of religious thought regarding disability, insinuates “the anti-colonial politics of disabled persons” (Meekosha 2008) within the Christian gospels so as to interrupt that humanist reading and its trajectory of trespass. Meekosha, H. (2008). 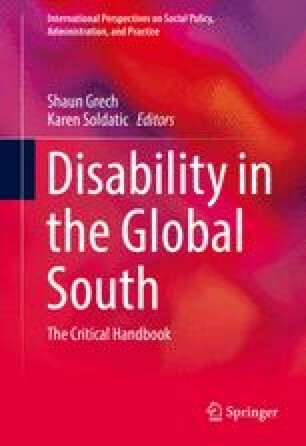 Contextualizing disability: Developing southern/global theory. Keynote paper given to Fourth Biennial Disability Studies Conference, Lancaster University, UK. September 2–4, 2008. Retrieved December 12, 2013, from http://wwda.org.au/meekosha2008.pdf.